Kasey Dunn is working to keep Oklahoma State stacked at receiver. 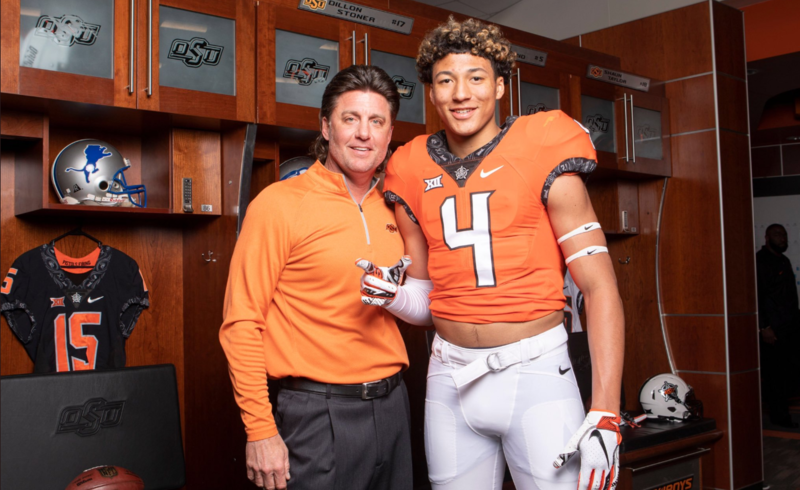 Matt Polk, a 6-foot-4 and 210-pound 2020 prospect, announced on Twitter he will be in Stillwater next weekend for an official visit. Polk, from Saguaro High School in Arizona, is a three-star prospect and ranks 114th nationally among 2020 receivers. He has offers from UCLA, Arizona, Cal, Purdue, Kansas, Tennessee and Florida. Although he is from Arizona, Polk has ties to Oklahoma State, as his father, Raymond Polk, played corner at OSU in the early 80s. Polk’s OSU offer came in January, and he was at OSU’s Junior Day a few months later. Polk’s class at Saguaro High is stacked. His classmates include five-star corner Kelee Ringo, four-star linebacker Damian Sellers, four-star corner Jacobe Covington, three-star offensive tackle Jaylan Jeffers and three-star quarterback Tyler Beverett. That’s six nationally ranked prospects at one high school in one class. There are also three more three-star prospects who aren’t nationally ranked, and a two-star kicker who is committed to USC. Polk and Saguaro won a state championship last season, outscoring opponents a combined 221-28 in the playoffs. Here are some highlights from Polks junior year.